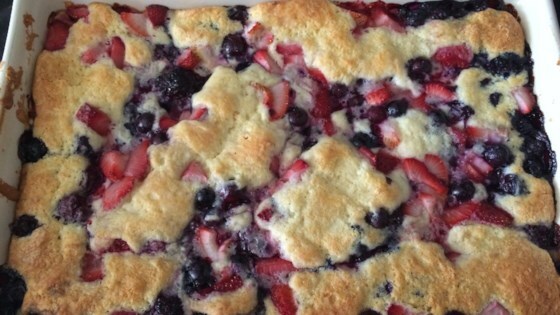 "Cobbler recipe from my Aunt Gerry, used by my mother for many years. Works with other fruits as well." Preheat the oven to 375 degrees F (190 degrees C). Grease a 9-inch square baking dish. Mix flour, baking powder, and salt in a bowl; set aside. Beat 1/2 cup white sugar and butter in another bowl until smooth. Stir flour mixture alternately with milk, into butter mixture until well mixed. Pour batter into prepared baking dish. Spoon blackberries and blackberry juice on top and sprinkle with remaining 1/2 cup sugar. Very tasty! I added 1 tsp. of cinnamon as others suggested. Will definitely make again. Need to look at the amount of sugar used to top it off as I think I used a bit too much. Easy and tasty. Will make again. Fantastic! I substituted peaches for some of the berries and used peach juice. Did not have a 9x9 pan so I used a deep pie dish. Easy and quick. We loved the flavor and the texture of the crust/biscuit. Can’t wait to try this with other fresh fruit like peaches! !